The district unit of the Akali Dal (Amritsar) at a meeting held under the presidentship of Mr Jeet Singh Alloarkh, here today criticised the Nanavati Commission Report related to the Anti-Sikh riots in 1984. The report was tabled in Parliament today. Panthic leaders today flayed the findings of Nanavati Commission report. In a statement, Bhai Ranjit Singh, former Jathedar Akal Takht, said the report was a cruel joke on the Sikhs who had suffered inhuman treatment during the “anti-Sikh riots” of November, 1984. Dr Joginder Dyal, State Secretary, CPI, Punjab, while dubbing Capt Amarinder Singh as the most “incompetent” Chief Minister alleged that the latter had been ignoring the problems of masses and only arranging “comforts” and foreign tours for himself, his Cabinet colleagues and MLAs. Members of the CPI hold a dharna near the residence of Punjab Panchayat Minister Lal Singh in support of their demand in Patiala on Monday. Heart patients being ‘used’ as guniea pigs? Mr Shamsher Singh Dullo, president of the Punjab Pradesh Congress Committee (PPCC), today urged the presidents of the district units of the party to mobilise the party rank and file at the grassroots level. He urged them to enroll youth especially college and university students, in the party. After the reorganisation of Punjab in 1966, the Congress found another contender for power in the state. Soon after formation of the Punjabi Suba, an Akali-led government was formed under the leadership of Justice Gurnam Singh, Subsequently, the Akalis consolidated their presence and became the main opposition and a party contending for power in its own right. Chief Minister Capt Amarinder Singh may have released grants worth crores for the development of his ancestral village Mehraj, but the alleged misuse of allotted funds has turned the village into a “living hell”. The state government had sanctioned Rs 6.5 crore for water supply and sewerage project in the village. The Punjab and Haryana High Court today scrapped the evaluation of answer-sheets by Guru Nanak Dev University on a petition challenging the results of “second” Punjab Pre-medical entrance test (PMET). The result was declared on July 7. In all, about 1500 candidates had taken the test. Citing political victimisation, Mr Malvinder Singh Mali, former press secretary to late Akali leader G.S. Tohra, today sent a letter to the Punjab Governor saying his son was denied admission to two SGPC-run engineering colleges under the Sikh minority quota. Taking cognizance of a report published in these columns yesterday that a clerk had forged the signature of an SGPC secretary to get two persons appointed as ‘sevadars’, the SGPC here today announced that it would hold an inquiry into the allegations. Taking a historic decision, the SGPC today formally allowed women to perform shabad kirtan at the sanctum sanctorum of Harmandar Sahib. Women have also been allowed to do seva of Palki Sahib and the Parkarma. The historic gurdwara commemorating the ‘Chotta Ghalughara’ (mass massacre) of Sikhs at the hands of Mughals in 1846 will have a museum. Mr Partap Singh Bajwa, Minister for PWD, Culture and Archives, gave this information while talking to The Tribune here yesterday. A 100-member Sikh jatha from the UK, under the banner of Guru Manyo Granth Khalsa yesterday visited the historic Khadoor Sahib Gurdwara, Angitha Sahib, 20 km from here, besides the museum and other historic places. The Punjab Government is still groping in the dark when it comes to providing funds for free power to the farming sector in the state. The government will have to pay approximately Rs 430 crore to the PSEB for providing free power to the small and marginal farmers. Reacting to the suspension of two cashiers following a robbery incident at the Punjab State Electricity Board office here, the board’s clerical staff of four subdivisions of the city today observed total strike. 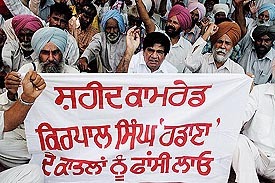 Protesters by “client states” of the Food Corporation of India, Punjab, over poor quality of rice being supplied to them, today, resulted in the repatriation of the Senior Regional Manager (SRM), Mr K. Siva Prasad, to his parent state, almost two years prior to completion of his four-year term. Mr T.R. Sarangal, Secretary, Health and Family Welfare, Punjab and Managing Director, Punjab Health System Corporation, paid a surprise visit to Civil Hospital here today. Workers of the Diamond Agro ghee factory today blocked traffic on the National Highway No. 1 in protest against the non-payment of wages. The Shiv Sena (Bal Thackeray), Punjab, Chairman, Mr Surinder Dogra (48), breathed his last after a brief illness in a private hospital of Amritsar today. NSS volunteers and students of the local Lyallpur Khalsa College have planted nearly 200 saplings of different species on the campus. Taking up a petition claiming attempts by Punjab’s Secretary (Home) Sukh Pal Singh Gill to protect the interest of his police officer brother by implementing a Supreme Court judgement from a later date, a Division Bench of the Punjab and Haryana High Court today issued notice of motion for August 18 and ruled that recommendations, if any, made by the government in pursuance of DSP’s seniority list be stayed till then. Some 224 anti-Sikh riots victim families who were allotted LIG (Low Income Group) one-room apartments at Ranjit Avenue by the government in 1991 now fear losing their houses. A memorandum in connection with the inefficiency of the police was handed over to the SDM, Mr D.S. Sandhu, by the Municipal Council president, Mr Charanjit Singh, and others here today. The Union Government will import 50,000 tonnes of DAP fertiliser for Punjab farmers. Indian Potash Limited has been authorised by the Centre to handle the import of the fertiliser, it is learnt. Farmers of Sriganganagar area yesterday forcibly opened gates of three sub canals at Sadhuwali, 35 km from here, sources said. Farmers who had virtually laid siege to the Jeevandesar headworks of the Bikaner / Gang canal at Sriganganagar yesterday dispersed after 10 hours on getting assurance from the Irrigation authorities for better supply of water. The Kheti Virasat Mission will approach the genetic engineering approval committee (GEAC) to demand that the approval given so far for the commercial cultivation of Bt cotton be revoked in wake of what it termed “shocking findings” put out by CICR (Central Institute of Cotton Research). Ms Rupan Deol Bajaj, Financial Commissioner (Revenue), Punjab, today directed the deputy commissioners of the state to ensure that all land registration deeds are done on the basis of the “collector rates” fixed by the Punjab Government. Fear and tension gripped the Kapoor Basti located in a slum area behind the new Sabzi Mandi here following the alleged beating of a Bihari woman, Indra Wati (45), under whimsical grounds by her neighbour after stripping her naked and tying her hair with a tree on August 6 night. A report said later they also cut her hair. In an unusual case of theft about 24 copper plates of honour board carrying the names of officers who had worked in the construction and commissioning of the plant were stolen from the main office of the Guru Gobind Singh Super Thermal Plant, Ropar. The police arrested three persons for smuggling liquor at a naka on the Jalandhar road yesterday. According to Mr Lok Nath Angra, SSP, the driver of a truck (MP-09K-8468) going towards Jalandhar was asked to stop the vehicle at the naka but he tried to escape. The police party chased and intercepted the vehicle. Harinder Singh a resident of Kamalpur village allegedly cheated his neighbour by selling him a piece of land which was previously sold to his own wife and mother. A Phagwara couple was robbed of gold ornaments and cash at a dharamshala in Chintpurni after some persons offered them tea on Sunday. 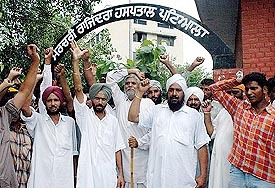 Protesting against power shortage in their village, residents of Bhokhra last night ransacked the village’s 33 KV grid. They reportedly manhandled PSEB staff and broke the windowpanes of the board office. Two persons were killed and six injured in an accident near Phagan Majra village on the Sirhind road here. Scientists are working at removing various defective genes from the human bodies for treating chronic diseases without any medicinal aid. Commissioning of rural water supply schemes in Ropar, Hoshiarpur and Gurdaspur has improved attendance, especially of girl students, in schools besides giving more time to women for both household and farming activities, says a study conducted by the Centre for Research in Rural and Industrial Development. The SGPC’s committee on education today revised the pay scales of the teaching and non-teaching staff posted in public, elementary and secondary schools run by it. All government-aided schools in Punjab will remain closed on August 10 in protest against the recent government decision to stop grants to these schools. The DAV College Managing Committee, New Delhi, today placed the services of Ms Madhu Sharma, Principal of the local DAV Girls School under suspension.